Whether you are looking to ride on the road or the dirt, San Luis Obispo and the surrounding areas offer a host of great rides for the recreational and avid cyclist. The Rest – Johnson Ranch, Irish Hills, Montano De Oro, Resevoir Canyon – Check out CCCMB link below for maps. Highway 1 between San Luis Obispo and North to Cambria and San Simeon – lots of flats, rolling ups and downs with awesome ocean views. 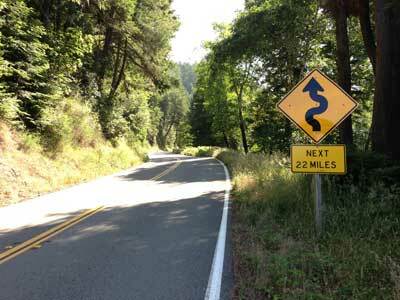 There is a wide shoulder until you are North of Cayucus and going early in the mornings is good to avoid the traffic. Edna Valley – just to the South side of San Luis Obispo you can loop through the vineyards out to Lopez Lake or even Huasna if you are looking for a longer ride. North County – endless country roads. Watch out for the afternoon heat and the ‘sometimes’ not so friendly drivers. For a good list of rides check out the San Luis Obispo Bicycle Club. There are a host of mountain biking opportunities in the San Luis Obispo (SLO) area that include two primary and two secondary rides areas in SLO proper. Outside of the city limits there are serveral options that range from Beach areas to backcountry, all of which are worthly of exploring. Depending on your ability you can link together a variety of rides from 8 to 30 plus miles. There is a combination of fire roads, single tracks and sections you might not be able to identify as a trail. Most of this area if within the Los Padres National Forest but there is also private property and military property and you won’t be able to tell the difference until you run into one of the locals … some nicer than others. Stenner Creek Road – Intersecting Highway 1 about 1 mile North of San Luis Obispo. 4ish miles of asphalt and fire road ending at a farm house. There is a small bridge with a gate. Once through the gate you can either continue on the fire road up to the train tracks or take a left on a small single track that heads straight up the hill to the train tracks. Welcome to the entry of the lower West Cuesta Grade. Poly Canyon Road – Accessed through the California Polytechnic State University campus, behind the dorm areas, this is great warm up climb up to the train tracks. You usually have to hop over a few gates that they use to keep the cows in check. All fire road with a few steep pitches. Once you get to the top gate you can go left (North Rim Trail), right (steep pitch up to the tracks), straight fire road that hooks back up with Stenner Creek Road. Shooters – The trail many people talk about, this is a world class single track that is moderately technical. Traffic is both up and down so watch out as you ride. Botanicals and Morning Glory – Usually just called Morning Glory (incorrectly) these trails also accessed from the start of TV Tower Road (connecting to the top of the Cuesta Grade) and this is the location of the TV Towers. You can’t miss it because there are the towers that include cell, TV and other radioactive assaults. Look downhill and you will see a gate and that is where the trail begins. Follow your nose any you will end up at the bottom of Shooters and can make your way back into SLO through Stenner Creek or by crossing back over to Poly Canyon. Elevator Shaft – this connects the bottom of Shooters (area) and he train tracks. An outstanding new trail that includes bridges, banked turns and more all in a short section. 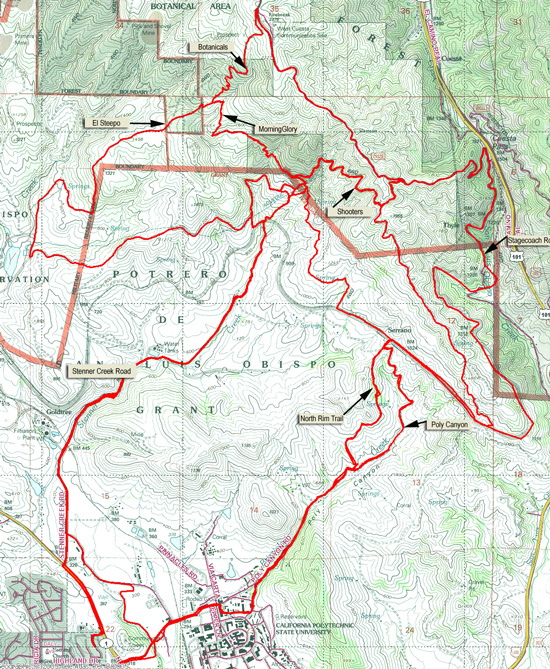 RedDog – everyone has a different name for some trails but this one connects the bottom of Shooters to the top of Poly Canyon. Take your like in your hands and drop through the Eucalytus trees to head over.